The head of Gambia's army has given his full backing to the country's president, Yahya Jammeh, amid a deepening political crisis. He initially accepted the result but changed his mind days later, citing electoral "abnormalities". In a letter to the pro-government newspaper, Gen Ousman Badjie pledged the "unflinching loyalty and support of the Gambia Armed Forces" to Mr Jammeh. Gen Badjie's intervention follows the threat of military action by the Economic Community of West African States (ECOWAS) if Mr Jammeh refuses to leave office on 19 January. 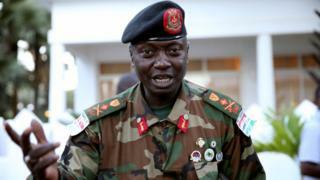 President Jammeh has said any such intervention would constitute an act of war. Mr Barrow's team had previously claimed the support of Gen Badjie. The army's support is seen as critical in building a transition after Mr Jammeh's 22 years in power. The tiny West African state has not had a smooth transfer of power since independence from Britain in 1965. The dispute over the election results has raised tensions in the region, with both neighbouring countries and international powers urging Mr Jammeh to step down. Mr Barrow won 43.3% of the vote on 1 December, beating President Jammeh's 39.6%. A third-party candidate, Mama Kandeh, won 17.1%. Those figures were revised from earlier totals, after the electoral commission discovered a tallying error affecting all candidates. The revised results did not alter the outcome of the election. However, Mr Jammeh declared that he would no longer respect the result and has launched a court action to annul the result. His security forces have seized control of the commission's headquarters in the capital, Banjul, and the head of the election commission has fled the country over fears for his security. Three private radio stations were also taken off air, in an apparent media crackdown. One has since resumed broadcasting music and advertisements only, with no on-air presenters or DJs. Despite the threat of military intervention and President Jammeh's protests, Mr Barrow's team said they plan to declare him as president on 18 December. In an interview with the BBC, Mr Barrow said he would not prosecute the former president after a transition, but focus instead on reconciling the country's opposing forces. "If South Africa can reconcile [after the racial system of apartheid ended in 1994], I see no reason why Gambians cannot reconcile. We are not saying prosecution; we said truth and reconciliation," he said.